Altus provides world-class technology workstations and now offers one of the most innovative, ergonomic, and secure med delivery solutions on the market. As of November 17, 2017, Altus officially launched the ClioMed EMR medication delivery cart. ClioMed is the most ergonomic EMR medication delivery solution on the market. Coupled with unsurpassed security with individual locking drawers and an intuitive design, clinicians will experience improved workflow while increasing patient satisfaction. ClioMed re-establishes the standard for EMR medication delivery. Clinician’s average over 5 miles of walking every shift and a large portion of that is due to the time they spend retrieving supplies. This often results in fatigue and errors in medication delivery as clinicians are distracted or taken away from the task at hand. Bringing med delivery to the point of care eliminates wait time and walks to the med room and can improve your patient satisfaction. ClioMed is designed to give clinicians time back to provide better care. ClioMed has side-access drawers that allow clinicians to experience an ergonomic, smooth workflow to access each of the 6 bins without bending or reaching. With a true sit-to-stand design, it adjusts to each user’s preference. Users will experience full visibility within the drawers and all bins are removable and reconfigurable. Each drawer can be labeled electronically to identify individual drawers or even open them all for quick and easy restocking. ClioMed has a lightweight design which allows clinicians to get their job done comfortably due to the superior mobility. Clinicians average 2.5 hours per shift retrieving supplies, taking them away from the point of care longer than is necessary! Drastically reduce this time and bring the focus back to the patient. 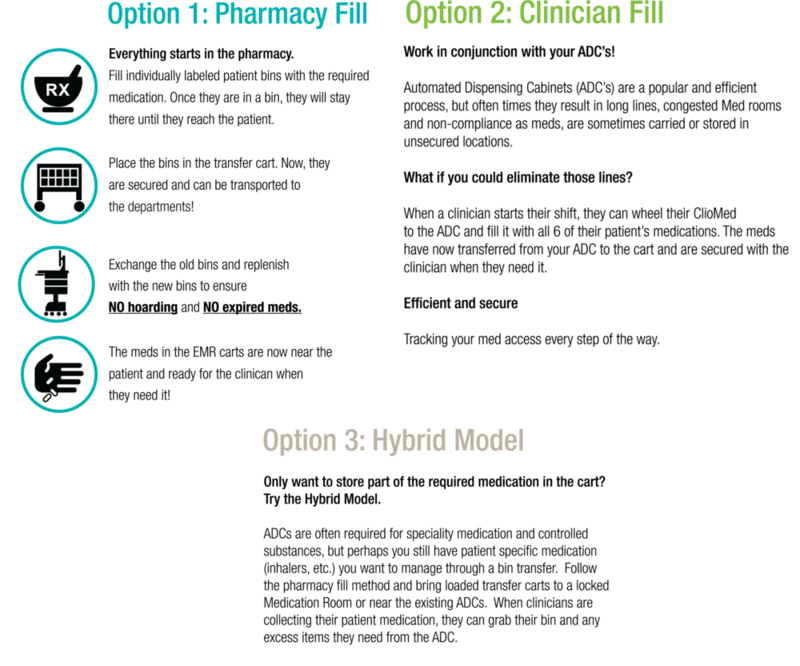 Clinicians can begin their shift by getting all of their patients’ medication at one time. Each patients’ medications will be individually locked and clinician access can be monitored at the cart from the central management software. The majority of medication errors are happening at the point of administration. ClioMed brings meds right to the point-of-care, reduces distractions, and creates an organized and traceable environment for clinicians and pharmacists alike. Individual drawers are tracked and locked with the support of an all-in-one software solution that is controlled by a user-friendly touchscreen. Clinicians can easily view and access patient medication within their electronically labeled drawers. Categorize by patient name, room number or supply type - all information that will be tracked at the ClioMed as well as on the central management software (CMS). The entire software platform is built-in to every cart with no additional software required. All of the carts are capable of communicating with a central management software to allow for audit tracking, user editing, cart and drawer labeling and setting changes from one central location.